Wow! I shouldn’t be surprised anymore that when I attend digital marketing events I leave inspired, amazed, and overwhelmed by the possibilities. 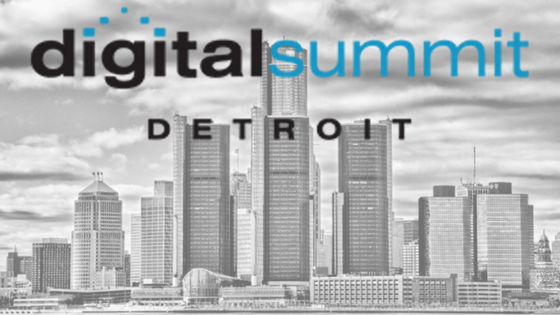 The Digital Summit Detroit exceeded my expectations by providing 30-minute sessions with a nice selection of single presenters and roundtable discussions allowing attendees an opportunity to enjoy a variety of topics with some overlap offering different views and solutions for the same topics. How to better utilize analytics to track changes in our audience and to determine our most effective content. The lessons I learned from the content discussions and analytics are summarized below. They could be the first step in refocusing our firms content marketing to address the issues and needs of our customers in places we are most likely to reach them. Developing content without knowing for sure who the audience is increases the potential for a flop. What I realized is our firm seldom interacts or receive feedback directly from the end-user regarding how they came to find our brand, what were the main deciding factors in selecting our company, and are they pleased with their product. Similarly, we never learn why (was it product or process) we failed to win their business.To fix this issues, we need to reconnect with the end-users of our products to see if they are the same demographics with the same interests we found 5, 10, 20, or even 30 years ago. My guess is that we will find today’s customer may look similar to the client of 5 years ago, but due to content overload, it is more difficult to reach the customer without a highly targeted message addressing their specific interests or goals. We still largely take the shotgun approach to our content distribution. If we spread the content widely enough with general interest topics, we will surely reach some potential clients, but are we going to find our brand advocates? Probably not. What’s worse is we will not reach people who are active in lifestyles our product would benefit or is related to other interests those individuals may have, but without content drawing a parallel between our product and how it enhances other aspects of their lives, we will never break through to this audience, let alone find a spokesperson to increase product and brand awareness. Finally, one of the ideas I found most interesting and potentially promising was experiential marketing. For our company, a heat bathing manufacturer, the product is about the experience and the feeling during and afterward. However, if a person has never experienced heat bathing in a semi-private to private setting, they have not been able to enjoy the relaxation and/or social and cultural benefits of the experience. Thus, hosting events and recording the responses to a bathers first experience could become our best content marketing yet. Permitting us to reach a larger audience. These new marketing ideas have been presented for review in our firm. I am excited for the opportunities and potential to gain from applying the best practices learned at #DigitalSummitDetroit. On October 26th, I will be a panelist at the A2HUG meet-up. Please come out and join us by reserving your seat. I’d be happy to share more of my experiences from the summit and Inbound Marketing.